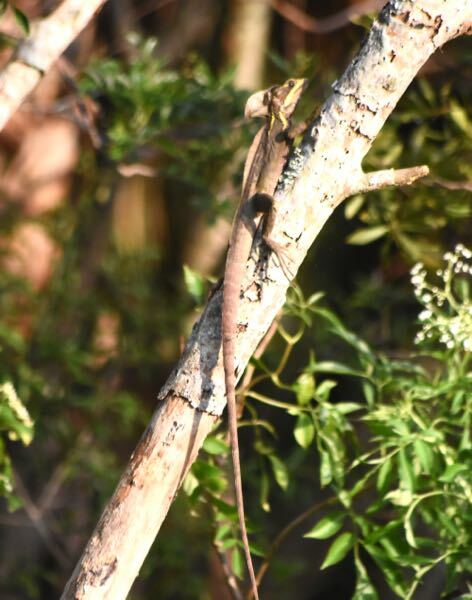 Brown basilisk lizard, photographed at Fern Forest Nature Center, Coconut Creek, Broward County, in March 2014. This is the Jesus Christ lizard, so called because of its ability to walk on water. And that's not an exaggeration. The brown basilisk lizard, scientifically known as Basiliscus vittatus, not only "walks" on water, it runs on water. Brown basilisks are not native to Florida but rather hail from Mexico, Central America and the northern portion of Colombia. According to the Florida Fish and Wildlife Conservation Commission, it arrived here circa 1976. It's not known how it got here but it's not hard to imagine that it came as a pet and escaped or was released into the wilds of South Florida. It's only found in 10 counties, with St. Lucie being the northern-most point. So far. The largest concentration of brown basilisks is in Miami-Dade and Broward counties, where they're regularly seen along canal banks. We've seen several in south Palm Beach County in the spring of 2016. They are not, at present, considered invasive. 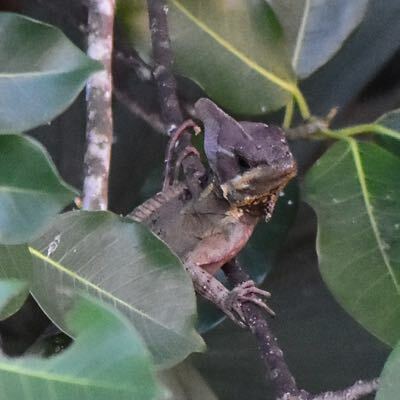 The FWC isn't sure what if any threat brown basilisks pose to native species, although it is believed to eat small vertebrates, including native lizards, as part of its diet. Brown basilisks males can be rather large, as long as two feet, though most are much smaller. Males also have a large crest on the back of their heads and a serrated crest that runs along their backs from the neck to the hind legs. Females are smaller and lack the crest. Both males and females have brown bodies with dark bars and yellow lateral lines. Males use the crest defensively to make themselves look bigger to predators than they really are, and to impress the ladies, of course. From May through August, Females lay three to 12 eggs at a time, with a moist hole in the ground serving as a nest. They provide no care of any kind after that. Eggs hatch in about two months, give or take. Flappy toes and strong, muscular legs are the key to the brown basilisk's ability to run on water. On a quiet surface, they can move as fast a five feet a second and can maintain that speed for about 15 feet, after which they swim. They are equally adept at running on land, jumping and climbing. Brown basilisks are members of Corytophanidae, a subfamily of iguanidae, the iguana family. Fun fact No. 1: Basilisk is derived from the Greek word meaning little king. Fun fact No. 2. Brown basilisks generally reach sexual maturity in less than a year. 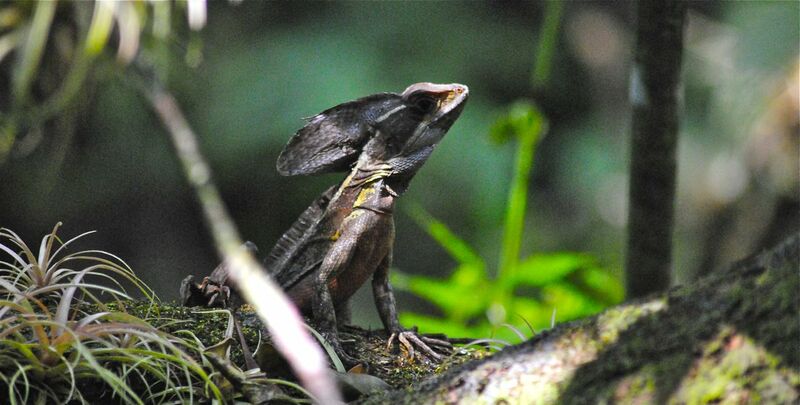 Basilisks that hatch during the wet season, however, can reach sexual maturity in as little as three months.